I've decided to give myself a little mini-challenge this week. I've had a bag full of cute plain vintage dresses sitting in my work room for months waiting for me to give them a make-over. I add to the bag every once in a while and imagine what fun appliques I could add to them for baby shower or birthday gifts, but the problem is I've never touched them. So, this week I will do something about it and make-over one dress a day and show you the results! 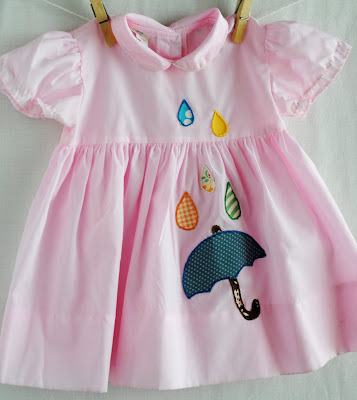 Here is dress number one - Raindrops Keep Falling on My Head. I will have to put new elastic on the sleeves before I give this one away, but for now I am just focusing on getting the appliques done. This was my first time using a split-stitch and it was really easy and surprisingly therapeutic once I got going. I just hope by the end of the week my fingers toughen up! Super super cute! 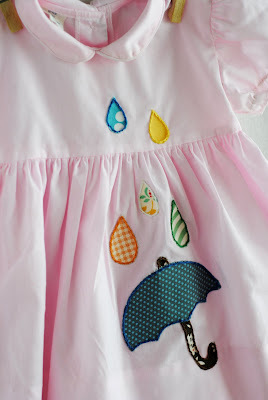 I just love the fabric you added too, fun fun! Adorable. I had the same idea for a bag of vintage dresses that are sitting be my sewing machine waiting new elastic.